St John island is a tiny island in the US Virgin Islands in the Caribbean Sea, with some of the most beautiful beaches in the world. 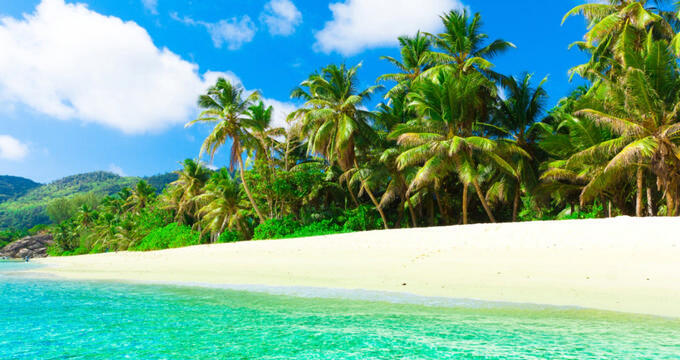 Most people love the magnificent north shore beaches like Trunk Bay, Maho Beach, Cinnamon Bay, and Honeymoon Beach, which are protected from the big surf and have long stretches of perfectly white sand splashed with crystal-clear azure waters and fringed by stately coconut palms. Except for Trunk Bay beach, all St John beaches are free to access. Located east of Trunk Bay, about a mile from Maho Bay Beach, Cinnamon Bay is a popular spot for snorkeling, with shallow, clear water and an easy distance to Cinnamon Cay, a small, low-elevation, sandy island. 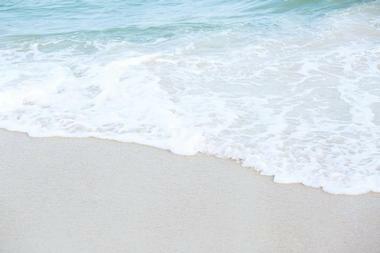 It is great beach for the kids, shallow, protected, and safe. 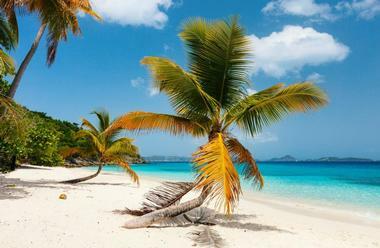 The half-mile long beach is the longest on St. John and is considered one of the most beautiful, with pristine white sand surrounded by stately palm trees. The bay is part of Virgin Islands National Park and is located near the historic colonial Danish Cinnamon Bay Plantation, today a museum showcasing sugar making in the Danish West Indies. Camping is permitted and there is a range of camping facilities as well as showers, restrooms, and a snack bar. Cinnamon Bay Water Sports rents snorkeling equipment, sailboards, sea kayaks, and small sailboats. 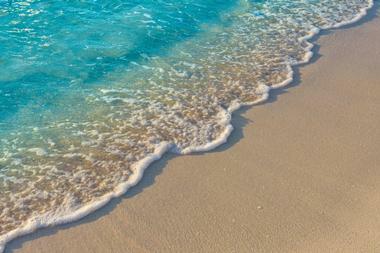 Denis Bay Beach is quiet and secluded, with beautiful powdery white sand. It is accessible only by boat or by a rugged trail, so not many people go there and it is very likely that you will have it all to yourself. The trail to the beach begins at the Peace Hill Trail, going down to the western end of the bay. Denis Bay is located within the national park. There are no amenities but the snorkeling is great. The property behind the trees that line the beach is private. Denis Bay was at some point home to the Deep Sea Fishing Club, and there are still old pilings in the water that used to support a dock. Francis Bay beach is one of rare St. John beaches that stays wide regardless of tide. Long and white, with powder-fine sand, it is spacious and has plenty of shade. It is great family beach, with superb swimming and snorkeling, and it is almost never crowded. Snorkeling is good on each side of the bay but the eastern side offers a bit more diversity of marine life, with sea fans, tangs, parrot fish, and reef squid. There are a few picnic tables, but not much more. The Francis Bay Trail runs along the beach and a salt pond that is home to many birds. Frank Bay Beach is located on the other side of the point from Cruz Bay, St John’s main port. Reaching it is an easy walk along Wharfside Village, past the old cemetery. 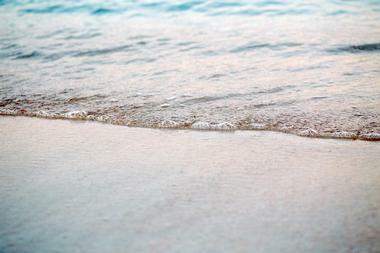 It is one of the longest beaches on St. John, so you can always find a quiet, private spot. The beach faces west, leeward of the trade winds, so the water is calmer than at other north shore beaches and is perfect for swimming, especially for kids. Snorkeling is also great, and you can see jacks, Spanish mackerel, yellowtail snapper, barracuda, tarpon, parrotfish, blue tang, eels, conch, stingrays, and sea turtles. The western end of the beach towards Maho is perfect for beginner snorkelers. Francis Beach is also great for paddleboarding because the water is so calm. The beach has toilets, trash cans, and picnic tables but no bars or restaurants. Great Cruz Bay is the first glimpse of St. John most visitors have – it is the place where the ferry docks. It is also the heart of the island’s cultural and economic life, full of shops, restaurants, and bars. Great Cruz Bay has a beautiful white sandy beach, the location of the Westin Resort. The beach is edged with stately palm trees that provide pleasant shade. Watersports equipment is available for rent, as are beach umbrellas and beach chairs. There is a water trampoline in the middle of the bay that children love. The water is normally very calm, perfect for swimming, especially for kids. Seagrass in the shallow water is common. Hawksnest Bay Beach is located in Hawksnest Bay, on St John’s north shore. It is one of several popular beaches in the bay. It is fairly narrow, with soft white sand, and is edged with dense sea grapes that provide pleasant shade. Keep an eye on the tide, when it comes in the beach becomes very narrow strip. The beach can be reached from Cruz Bay on North Shore Road, and has a large parking lot on the left side of the road. Hawksnest is not as protected as many of the other St. John beaches because of its orientation, so be prepared for a bit of surf. 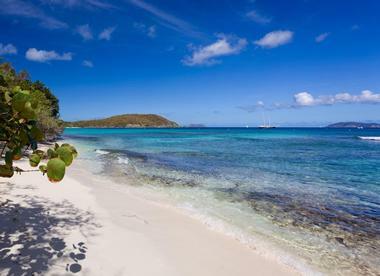 Honeymoon Beach is one of seven beaches that are part of the Caneel Bay Resort. 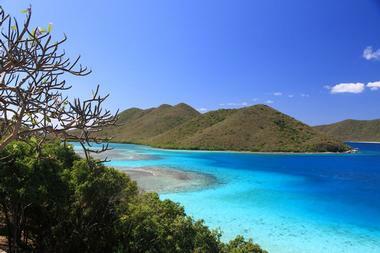 It is also part of the Virgin Islands National Park. 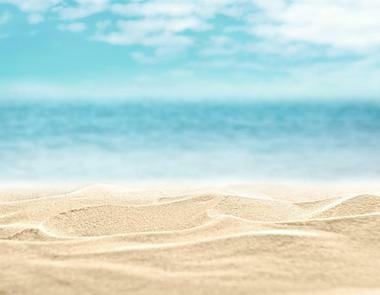 While the beach itself is free for anyone to use, only the guests of the resort can use the beach facilities, such as beach chairs and towels. While you can drive to the Caneel Bay Resort by going south on North Shore Road, you can also hike to the beach by taking the Lind Point Trail. It is a mile-long very scenic and beautiful hike. Honeymoon Beach has powder-soft white sand and clear shallow water and is shaded by a line of beautiful, tall coconut palms. There is a sports “shack” renting out kayaks, stand-up paddleboards, masks and fins, and beach chairs. During the high season, Canella Beach Hut offers snacks and drinks. Jumbie Beach is one of St. John’s smaller beaches – it is only 100 yards long and is located on St John’s north shore. Because of limited parking, it is never too crowded. 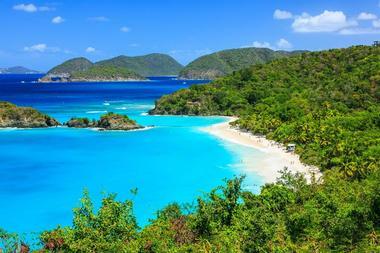 Most people prefer to go to the very popular nearby Trunk Bay. Jumbie Beach consists of perfectly white sand edged with dense sea grapes. The constant wind and pounding surf create quite a dramatic setting. When the north shore beaches are all rough, then count on Jumbie Beach being really rough. But, most of the time, the beach offers a wonderful spot for relaxation under the sun and cooling in the perfectly clear, aqua green water. Unfortunately, the strong surf means that the snorkeling not too good. 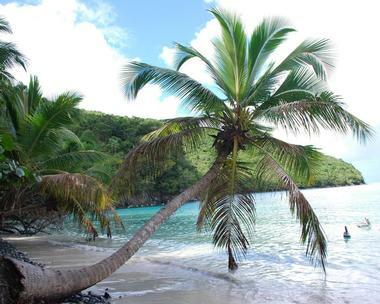 Lameshur Bay Beach is considered one of the most beautiful beaches on St. John. It is different from most protected beaches on the north shore. It is located on the rugged south shore of St John. It is very remote, with fine sand beach and crystal-clear water. There is plenty of shade along the beach. The bottom of the bay is a combination of sand and seagrass, and away from shore it is all seagrass, a place to see sea turtles and rays, in fact one of the best spots on St. John to see these magnificent creatures. There are no too many facilities except several picnic tables and BBQ grills. Nearby are the ruins of an old sugar mill and several great hiking trails run along the beach. The access to the beach is by rough dirt road and is suitable only for all-drive vehicles. 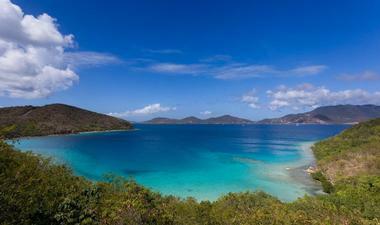 Leinster Bay is considered the best snorkeling spot on St John. A mix of seagrass and coral, sand and cobblestones provides a great environment for rich marine life. You can expect to see schools of fish, turtles, rays, starfish, conches, and colorful magnificent hard and soft corals. Snorkeling is the main reason people come to Leinster Bay in very large numbers, so expect to see crowds on the beach. Beautiful Waterlemon Cay in the middle of the bay is a bonus. If you are really adventurous, you can visit the bay on a stand-up paddleboard. Access to the water from the small sandy or cobblestone beach is fairly easy. Swimmers should be aware of strong current on the western end of the Waterlemon Cay. With so many spectacular beaches on St. John, Maho Bay Beach is everyone’s favorite: Crystal-clear waters, a powder-soft white beach surrounded by a 1,000-foot-high forested slope and fringed by stately coconut palm trees, lush tropical plants, and over 50 species of tropical birds. And in the water there are seagrass beds, green sea turtles, and magnificent thriving coral reefs. The surf is light and the entry into the water shallow, making the beach perfect for kids. Snorkeling is spectacular and it is easy to spot rays and schools of fish. Corals and reef fish can be spotted along the western or eastern shorelines. Salomon Bay beach is one of those St. John hidden jewels: A secluded and off-the-beaten-path location, powder sugar fine sand, clear aqua blue waters, and not too many people. You can drive to the beach, but hiking there is so much more satisfying. From the National Park Visitor’s Center in Great Cruz Bay, take the Lind Point Trail for about a mile until you reach the beach. It is an easy and scenic hike with some nice observation spots. If just enjoying the beauty, sun, and light breeze is not enough for you, there is a watersports shack at Honeymoon Bay, just around the bend. You can rent stand-up paddleboards or kayaks and get some refreshments. Snorkeling is spectacular because the corals are easily visible in the shallow waters and are surrounded by thousands of colorful reef creatures. 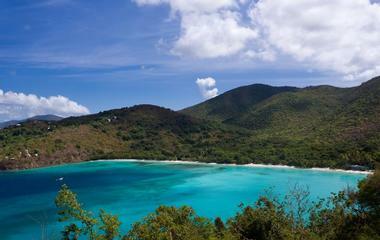 Salt Pond Bay beach is a protected cove with fine white sand, offering some of the best snorkeling in St. John. Many people come to the beach using the hiking trail because it is so beautiful. 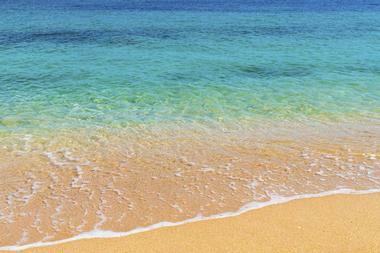 The beach is crescent shaped and sunny, always enjoying a light breeze from the sea. Shallow water access makes this a great spot for swimmers. Most of the time the water is calm and there is no much surf because of the cove’s protected location. 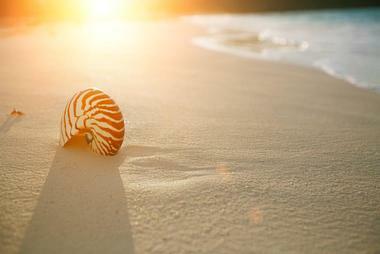 Snorkelers can expect to spot sea turtles, giant hermit crabs living inside of conch shells, rays, and schools of fish. The best snorkeling is around the rock hump in the middle of the bay. Trunk Bay is St John Island’s most famous, most popular, and most photographed beach. It is picture-perfect, with a quarter mile of fine white sand, azure waters, and a fringe of stately coconut palms. Snorkeling has a unique feature here: The self-guided Underwater Snorkeling Trail. There is even underwater information about different coral formations and marine life. The beach has a snack bar/grill, showers, restrooms, souvenir shop, and lifeguards. Trunk Bay is the only beach on St John that charges an entrance fee. The beach can get crowded, but you can find a bit of privacy if you are willing to walk to the west end.